I have been preaching about how great rosé is this time of year to anyone who will listen. While there is no doubt that we have seen a huge increase in how much rosé has sold each year, I often wonder why it is not even more. The wine and fresh and lively…and inexpensive. Rosé goes great with a huge variety of different foods, or is delicious all by itself. While in France last week, I found myself drinking it every day...perfect with lunch or a light dinner. So, I ask you, why are not more people drinking rosé? I have come to the conclusion that some people might look at the bottle and think that it is a sweeter wine, like white zinfandel. Well, my friends, nothing could be further from the truth. The vast majority of them are dry, and are simply delicious expressions of their region. The light pink color comes from regular old purple grapes that are left to sit in their skins (where the color comes from) until the desired level of “pinkness” is achieved. The result is a fabulous drink that teeters between white and red…rosé. 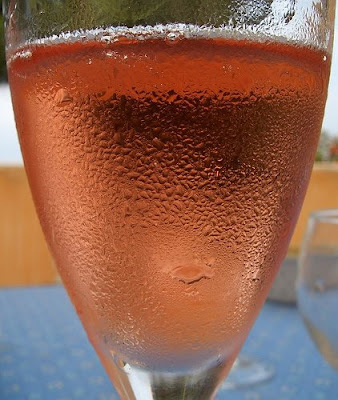 So, I will say it again…if you are not drinking rosé this Summer, you are missing out…no kidding.